The wrist is a complex joint that bridges the hand to the forearm. It is actually a collection of multiple bones and joints. The bones comprising the wrist include the distal ends of the radius and ulna, 8 carpal bones, and the proximal portions of the 5 metacarpal bones (see the images below). Bones of the wrist, palmar view. Bones of the wrist, enlarged view. All of these bones participate in complex articulations that allow variable mobility of the hand. Relative to the forearm, the hand is capable of 3 degrees of freedom: (1) flexing and extending, (2) pronating and supinating, and (3) deviating ulnarly or radially. [1, 6, 7, 8, 9] In order to maintain mobility without sacrificing stability, the wrist joint has a complex configuration of ligaments, as shown in the following images. 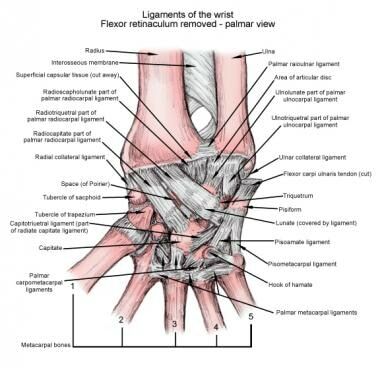 Ligaments of the wrist, palmar view. The anatomic linkage between the distal forearm and the hand is composed of 15 bones: 8 carpal bones, the distal radius and ulnar, and the bases of the 5 metacarpals. 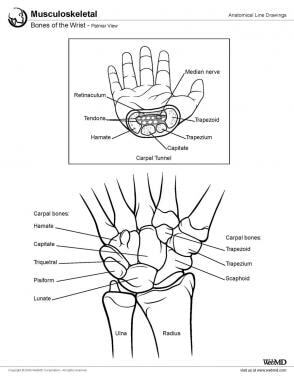 The carpal bones are organized into 2 groups, a proximal row and a distal row. The proximal row is found at the level of the distal wrist crease and includes the scaphoid, lunate, triquetrum, and pisiform. The second row of carpal bones, the distal row, is made up of the trapezium, trapezoid, capitate, and hamate; the distal row articulates with the bases of the 5 metacarpal bones. The proximal carpal row bones represent an intercalated segment, as no tendons insert upon them. For this reason, their movement is dependent entirely on mechanical forces from surrounding articulations. 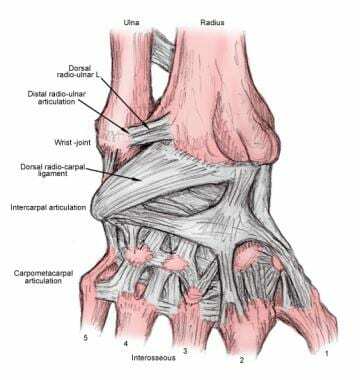 Ligaments of the wrist, dorsal view. 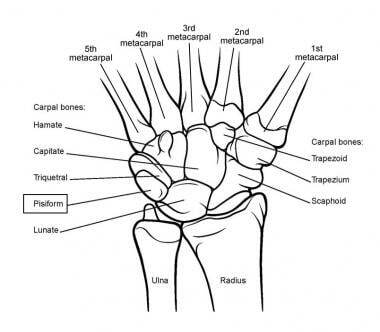 The radioscapholunate ligament is found between the long and short radiolunate ligaments at the distal radius in the region spanning the scaphoid and lunate fossa. The radioscapholunate ligament attaches distally between the volar and proximal segments of the scapholunate interosseous ligament at both the scaphoid and lunate. 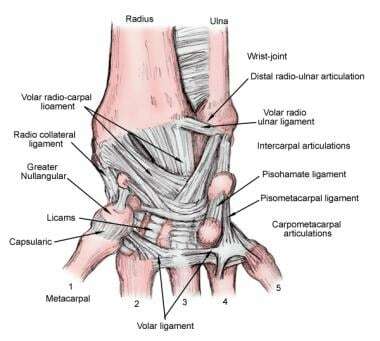 Volar carpal ligaments and bones. AIA = anterior interosseous artery; C = capitate; CH = capitohamate; H = hamate; L= lunate; LRL = long radiolunate ligament; P = pisiform; PRU = palmar radioulnar ligament; R = radius; RA = radial artery; RSC = radioscapholunate ligament; S = scaphoid; SC = scaphocapitate ligament; SRL = short radiolunate ligament; T = triquetrum; TC = triquetrocapitate ligament; Td = trapezoid; TH = triquetrohamate ligament; Tm = trapezium; TT = trapeziotrapezoid ligament; U = ulna; UC = ulnocarpal ligament; UL = ulnolunate ligament; UT = ulnotriquetral ligament. 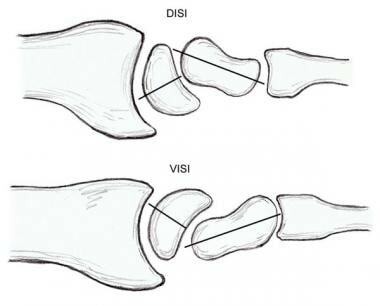 Dorsal/volar intercalated segmental instability (DISI/VISI). Research over the past few decades has increased our understanding of the normal anatomic variants germane to the hand and wrist. Without this working knowledge, variations in skeletal morphology may be misinterpreted as being clinically abnormal and lead to misdiagnosis and inappropriate intervention. Another area of variability within the midcarpal joint exists at the distal articulation of the scaphoid. Three variations have been identified: (1) separate facets for articulation with the trapezoid and trapezium, with an interfacet ridge separating the facets; (2) separate trapezoid and trapezium facets with palpable interfacet ridge, not visually identifiable; and (3) smooth articular surface not visually identifiable. 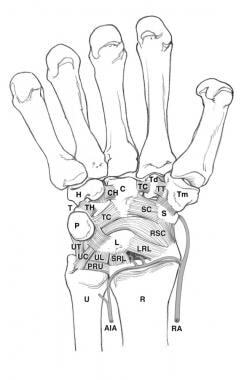 Isolated carpal coalition is an anatomic variant with a prevalence of 0.1%. This finding is more common in the black population, commonly bilateral, and has a strong female predilection. The lunotriquetral, followed by the capitohamate, are the most common carpal coalitions. Of note, persons with lunotriquetral coalition may have a widened scapholunate joint, representing a normal variant. Kijima Y, Viegas SF. Wrist anatomy and biomechanics. J Hand Surg Am. 2009 Oct. 34(8):1555-63. [Medline]. Pfirrmann CW, Zanetti M. Variants, pitfalls and asymptomatic findings in wrist and hand imaging. Eur J Radiol. 2005 Dec. 56(3):286-95. [Medline]. Green DP, Hotchkiss RN, Pederson WC, Wolfe SW, eds. Green's Operative Hand Surgery. 5th ed. Philadelphia, Pa: Churchill Livingstone Elsevier; 2005. 2313. Nagao S, Patterson RM, Buford WL Jr, Andersen CR, Shah MA, Viegas SF. Three-dimensional description of ligamentous attachments around the lunate. J Hand Surg Am. 2005 Jul. 30(4):685-92. [Medline]. Watson HK, Weinzweig J, eds. The Wrist. Philadelphia, Pa: Lippincott Williams & Wilkins; 2000. 1008. Nichols JA, Bednar MS, Murray WM. Orientations of wrist axes of rotation influence torque required to hold the hand against gravity: a simulation study of the nonimpaired and surgically salvaged wrist. J Biomech. 2013 Jan 4. 46(1):192-6. [Medline]. [Full Text]. Iida A, Omokawa S, Moritomo H, Aoki M, Wada T, Kataoka T, et al. Biomechanical study of the extensor carpi ulnaris as a dynamic wrist stabilizer. J Hand Surg Am. 2012 Dec. 37(12):2456-61. [Medline]. Tang JB, Chen YR. In vivo changes in contact regions of the radiocarpal joint during wrist hyperextension. J Hand Surg Am. 2012 Nov. 37(11):2257-62. [Medline]. Halaki M, O'Dwyer N, Cathers I, Heritier S. Systematic nonlinear relations between joint mechanics and the neural reflex response with changes in stretch amplitude at the wrist. J Biomech. 2012 Nov 15. 45(16):2755-62. [Medline]. Ruby LK, Cooney WP 3rd, An KN, Linscheid RL, Chao EY. Relative motion of selected carpal bones: a kinematic analysis of the normal wrist. J Hand Surg Am. 1988 Jan. 13(1):1-10. [Medline]. Kuo CE, Wolfe SW. Scapholunate instability: current concepts in diagnosis and management. J Hand Surg Am. 2008 Jul-Aug. 33(6):998-1013. [Medline]. Taleisnik J. 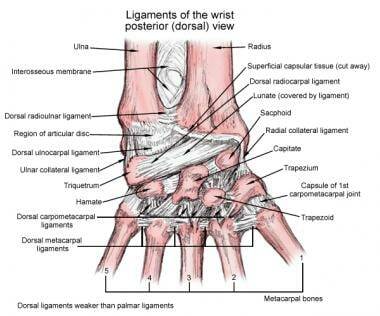 The ligaments of the wrist. J Hand Surg Am. 1976 Sep. 1(2):110-8. [Medline]. Brown RR, Fliszar E, Cotten A, Trudell D, Resnick D. Extrinsic and intrinsic ligaments of the wrist: normal and pathologic anatomy at MR arthrography with three-compartment enhancement. Radiographics. 1998 May-Jun. 18(3):667-74. [Medline]. Viegas SF, Yamaguchi S, Boyd NL, Patterson RM. The dorsal ligaments of the wrist: anatomy, mechanical properties, and function. J Hand Surg Am. 1999 May. 24(3):456-68. [Medline]. Berger RA, Imeada T, Berglund L, An KN. Constraint and material properties of the subregions of the scapholunate interosseous ligament. J Hand Surg Am. 1999 Sep. 24(5):953-62. [Medline]. Short WH, Werner FW, Green JK, Masaoka S. Biomechanical evaluation of the ligamentous stabilizers of the scaphoid and lunate: Part II. J Hand Surg Am. 2005 Jan. 30(1):24-34. [Medline]. Janis JE, ed. Carpal instability and dislocations. Essentials of Plastic Surgery. St. Louis, Mo: Quality Medical Publishing; 2007. 522-30. Postacchini F, Ippoplito E. Isolated absence of human carpal bones. Teratology. 1975 Jun. 11(3):267-71. [Medline]. Poznanski AK. Hand and Radiologic Diagnosis With Gamuts and Pattern Profile. 2nd ed. Philadelphia, Pa: WB Saunders; 1984. 67-96. Viegas SF. Variations in the skeletal morphologic features of the wrist. Clin Orthop Relat Res. 2001 Feb. (383):21-31. [Medline]. Cross-section of the wrist joint. Myles Anthony Phillips for reminding me what a miracle life is.